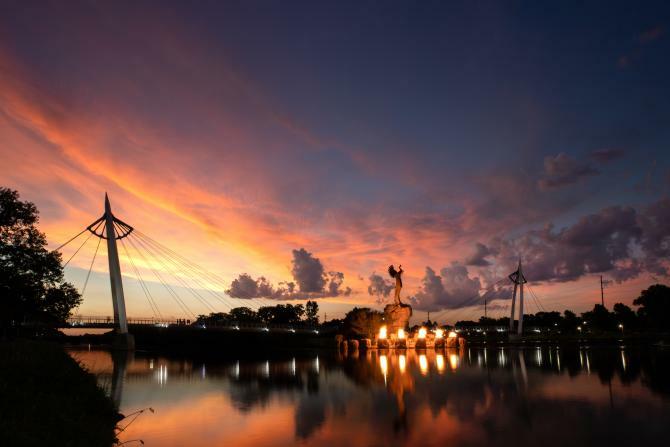 One of the most iconic images in Wichita, the Keeper of the Plains stands at the confluence of the Big and Little Arkansas rivers. 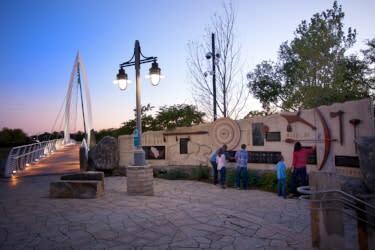 This 44-foot, 5-ton weathered steel sculpture was donated to Wichita by Native American artist Blackbear Bosin in 1974. It sits atop a 30-foot pedestal overlooking the city. The Ring of Fire occurs when the firepots are lit and will burn following the schedule above for 15 minutes every evening. All schedules are weather depending, including river levels. The Ring of Fire will not be turned on in high winds, rain or other inclement weather. If the river is too high, or if a person is too close, they will not be turned on. The ceremony is sacred to the Native people of Wichita and represents the relationship of earth, water, air and fire. People come from all over the world to witness the greatness of the Keeper of the Plains. Visit the Keeper by crossing pedestrian suspension bridges from either the intersection of west Central Avenue and Nims, near Exploration Place, or on McLean Blvd. If visiting during the day, step inside the Mid-America All-Indian Center to learn even more about the history and culture behind this Wichita icon. The Mid-America All-Indian Center features nearly 30 other pieces of Blackbear Bosin’s artwork and much more inside.